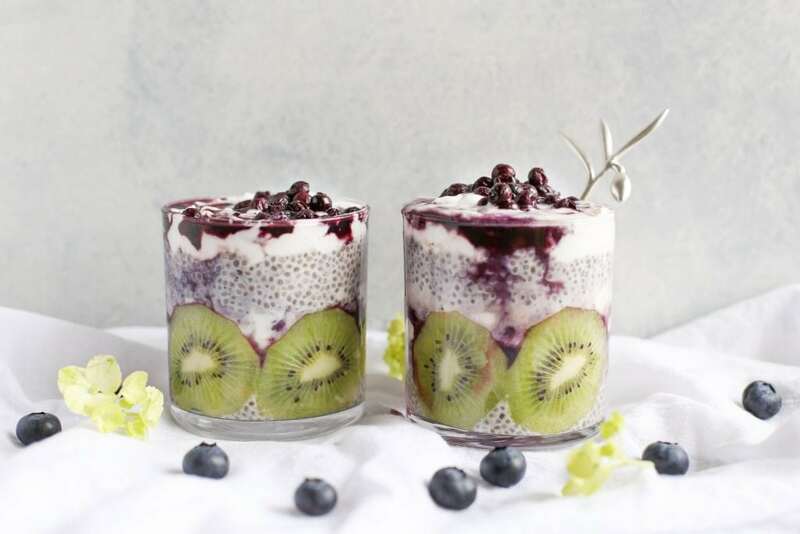 Chia Pudding is an amazing treat that can be enjoyed for breakfast or snack. It is very healthy with minimal carbs and sugar but also incredibly satisfying. The chia seed was a staple of the Incan, Mayan and Aztec cultures due to it’s ability to provide sustained endurance in a very small package. The seeds are tiny but soak up liquid when soaked overnight make a wonderfully cool refreshing pudding that can be topped with a variety of fruits, nuts and sweeteners as desired. This chia pudding recipe is very easy with only 4 ingredients and no cooking required! Mix the chia seeds and your favorite milk product in a bowl as per the package directions and place in the fridge for at least 4 hours. If you are using an unsweetened milk product, stir in some honey or maple syrup to sweeten the mix. When the seeds have soaked up the liquid, it will be a pudding like consistency. Set the frozen blueberries out to thaw for about 30-45 minutes. Slice the kiwi and layer the ingredients in a pretty glass jar for serving. Enjoy!